I feel like I'm looking in a mirror when I read this comic. Me too, Waiting Man. This is my life. I am always so confused. I want to have fun but I am not able to reach out to people. 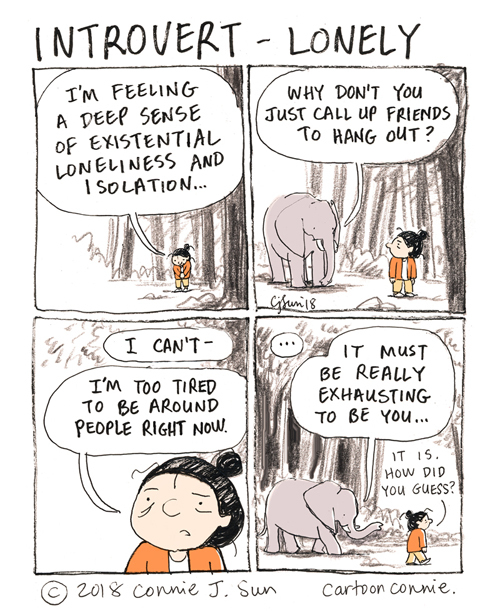 I'm tiring to myself too. @Brinda: as I used to tell my spouse when I had panic attacks: "You think it's hard to watch? You ought to be in here with it!" Other people can turn their noses up and walk away. I have to live with me. I feel like I need a group of people who aren't trying to be happy all the time...and accept me for who I am...? In the absence of that, I wish I could just go to some small town where no one knows me with pretty trees and never talk to anyone.